Subscribers to Sling TV or AMC may soon be able to watch those services through native apps for the fourth-generation Apple TV, a pair of leaks indicated on Wednesday. An AMC app will be "released shortly," according to a representative for the network, who responded to an AppleInsider reader. The person didn't say whether other networks tied to AMC, like IFC or BBC America, would be getting separate apps. A Sling TV app, meanwhile, briefly appeared on the tvOS App Store on Wednesday morning, MacRumors reported. One person said he was even able to download and use it, though it was quickly removed from the App Store. Images of the app suggest an interface similar to what Sling uses on other platforms, including a channel selector that pops up while live video continues. It's not clear why it was pulled, but apps will sometimes appear on Apple's other App Stores prematurely. Sling TV, notably, lets users stream live TV channels at a cost lower than a cable or satellite package. The cheapest bundle is in fact just $20 per month, which could put Sling in competition with Apple's rumored streaming TV service. Progress in launching that service has allegedly been impeded by Apple's insistence on a similarly "skinny" channel bundle costing less than $30 per month. 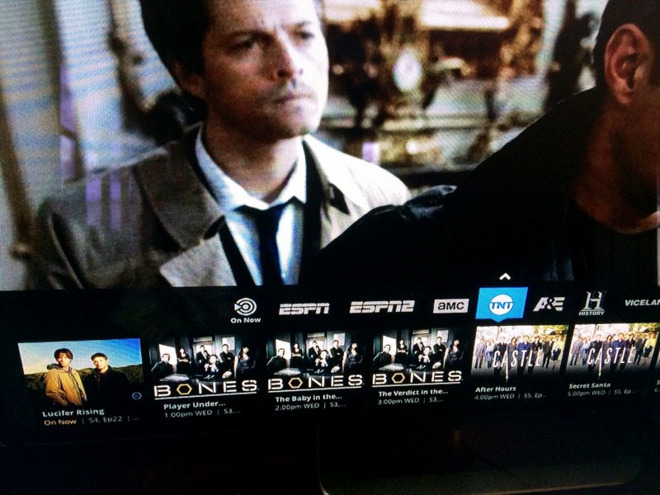 Update: The Sling TV screenshots have been revealed as fakes.